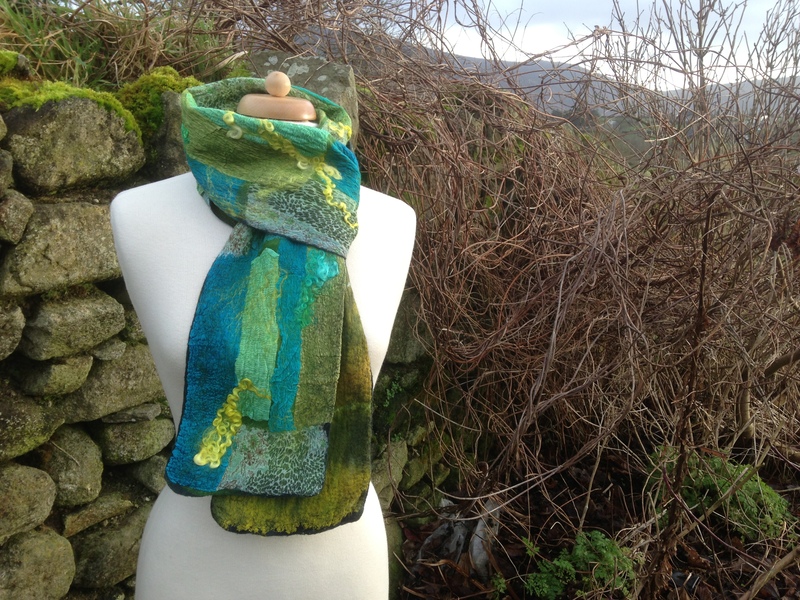 The weather has been a lot brighter today after a very wet start this morning, good news for me as it meant that I could snap a few pics outside of my nuno scarves and the wrap I felted earlier this week. 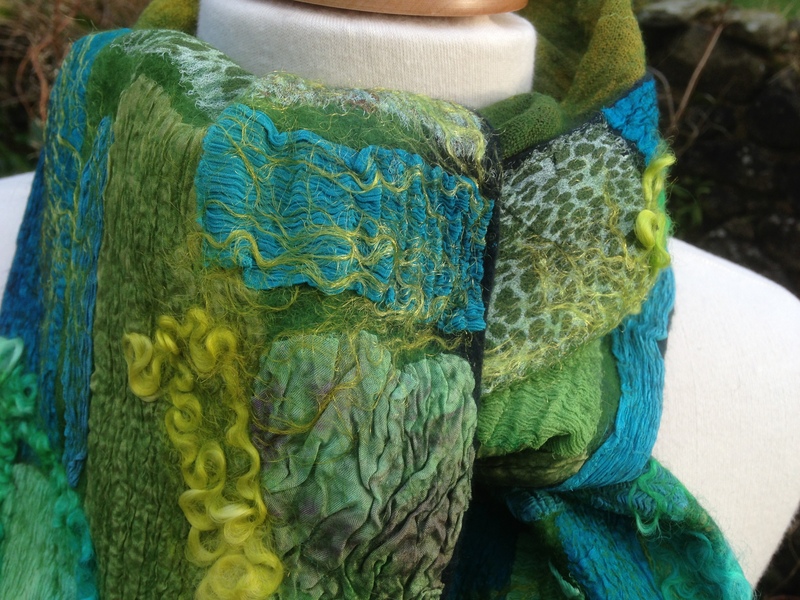 I’ll start with one of a simple scarf, this was felted combining ponge silk with some of Leiko’s beautiful hand dyed superfine merino and embellished with hand dyed silk throwster’s waste, a welcome Christmas present from Carmen. I love teaching this scarf as a beginner’s nuno felting project, it’s always successful and such a beautiful way to learn a new technique! 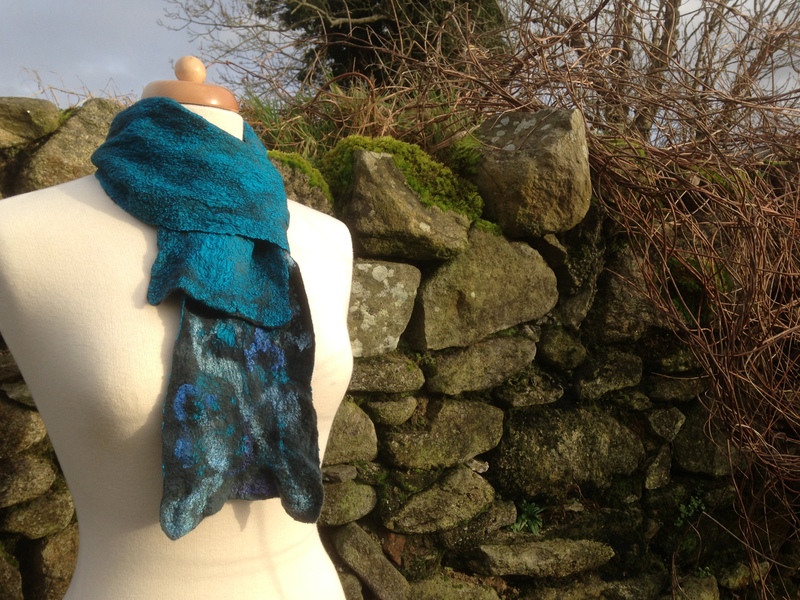 The second picture is of a large mosaic style scarf felted combining my own hand dyed cotton gauze (dyed under the watchful eye of Jan Durham and written up in this post last spring! ), more of Leiko’s merino and a whole selection of different weights of silk fabric. Good friend Carole buys silk pieces by the weight in the US and then we do a swap for mohair off cuts from Cushendale Woollen Mill, Cushendale is a wonderful source of locally produced knitting yarn and weaving just down the road from me here at Clasheen. I totally forgot that I needed to send Carole another pack of these goodies so many apologies, I’ll head over to Philip Cushen next week and get them in the post to you asap. Anyway, I also had a small pack of beautiful hand dyed teeswater locks and some firestar fibre in my favourite shades of acidic green, it’s strange to say that although I’m not a glitzy kind of gal at all I really do love the sheen and shimmer from the firestar!!! The printed silk in this scarf was part of my stash from the US, in fact I remember buying it in the Salvation Army on a foray with Sharon of the Tin Thimble but it could just as easily have been from one of the many trips I made with great friends Dawn or Merridee either, I LOVE these silk gathering events! If you’re interested in seeing more images of these pieces plus some photos of a large green wrap I made on Tuesday please check out this album on FB and do like Nicola Brown – Clasheen while you’re over there, only of course if you do like what you see!!! This entry was posted in Felt, nuno felt and tagged Dawn Edwards, Felt, Felting, firestar, Leiko Uchiyama, merino, nuno felt, nuno felt scarf, nuno felt wrap, nuno felting, silk by Nicola. Bookmark the permalink. Hope that you have a wonderful weekend.